What size gravel should I use for pathways and drives? Gravel is calculated by volume. As a guide, 30 sq meters, to a depth of 25 mm (1 inch), will require 1 tonne of gravel. Smiths have been recycling waste material from the construction industry for many years, with an impressive range of recycled products available. See recycled products. 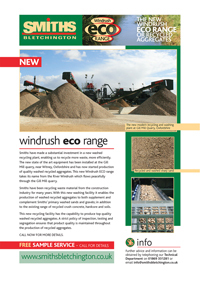 We can now add to this range with the introduction of our new Windrush Eco Range of washed recycled aggregates. Named after the River Windrush that gently flows through the Gill Mill Quarry on its way to join the River Thames. During the early part of 2013, Smiths made a substantial investment in a new washed recycling plant, enabling us to recycle even more waste, more efficiently - thus reducing the amount of waste sent to landfill. The new state of the art equipment has been installed at the Gill Mill quarry, near Witney, Oxfordshire and is now producing quality washed recycled aggregates. With this new washing facility it enables the production of high-end aggregates, to both supplement and complement our primary washed sands and gravels, in addition to the existing range of recycled material. Recycled aggregates are produced from a variety of construction waste products such as demolition materials - normally sourced locally - consisting of concrete, bricks, tiles, asphalt and tarmacadam spoil. A strict policy of inspection, testing and segregation ensures that product quality is maintained throughout the production of the washed recycled aggregates. More and more public and private sector construction projects require recycled materials. Demand for quality recycled material has doubled over the last two decades and some research suggests that the market for recycled aggregates is now 25% of the annual aggregates market. This figure is expected to rise considerably during the next ten years. Accordingly, alongside our primary aggregates, Smiths are committed to recycled products, to meet our customers’ changing requirements. Smiths can now offer these high quality recycled products, demonstrating not only their continued commitment to Customer Service but also to sustainable, environmentally friendly production.